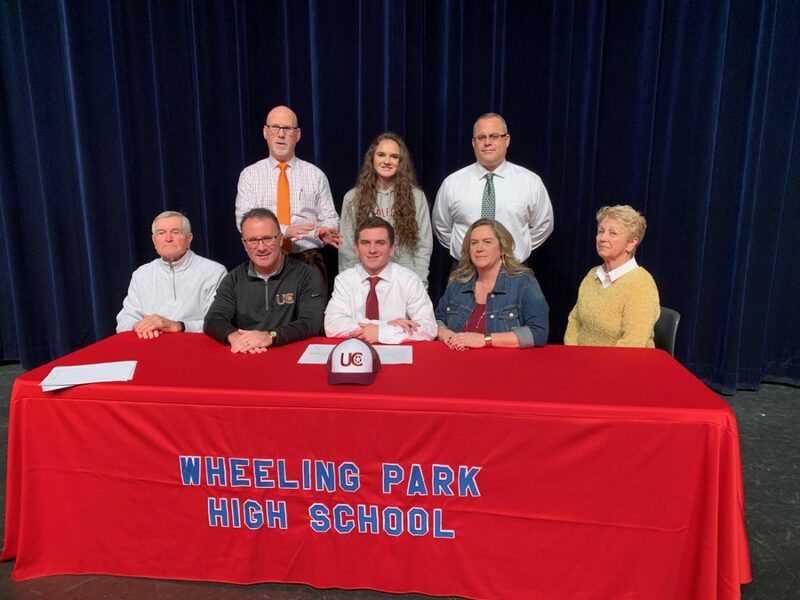 Wheeling Park prolific wide receiver Jack Stakem recently signed his letter of intent to continue his academic and athletic careers at the University of Charleston. Stakem was a three-year starter and letterwinner for the Patriots. For his career, he had 104 catches for 1,496 yards and 18 touchdowns. During his senior season, he was named second team all-state, and first team All-Valley and All-TRAC. During his junior season, he was first team All-Valley and All-TRAC, as well as special honorable mention all-state. He has also excelled as a four-year letterwinner in basketball and two-year letterwinner in track. Other activities include National Honor Society, freshman mentor, four-year Drug Free Club, Leadership Wheeling graduate and Special Olympics volunteer. Stakem, center, is joined, from left, by Floyd Shuler, Eric Stakem, Karen Stakem and Pat Shuler. Back row is Wheeling Park athletics director Dwaine Rodgers, Maggie Stakem and football coach Chris Daugherty.